Today is the second full day of Ramadan, a holiday celebrated by Muslims that includes fasting during the day. I'm a Christian, so I don't celebrate Ramadan, but I do have fond memories of living in Egypt and getting bags of dates and snacks thrown in my taxi window at sunset when everyone is breaking their fast. Free snacks are always a win in my book. In Egypt they also tend to decorate using some of their traditional fabric motifs more during Ramadan than any other time of the year. This type of fabric has been made by men that appliqué gorgeous designs onto a base fabric (you can see examples of this on some pillows in my home in this post). 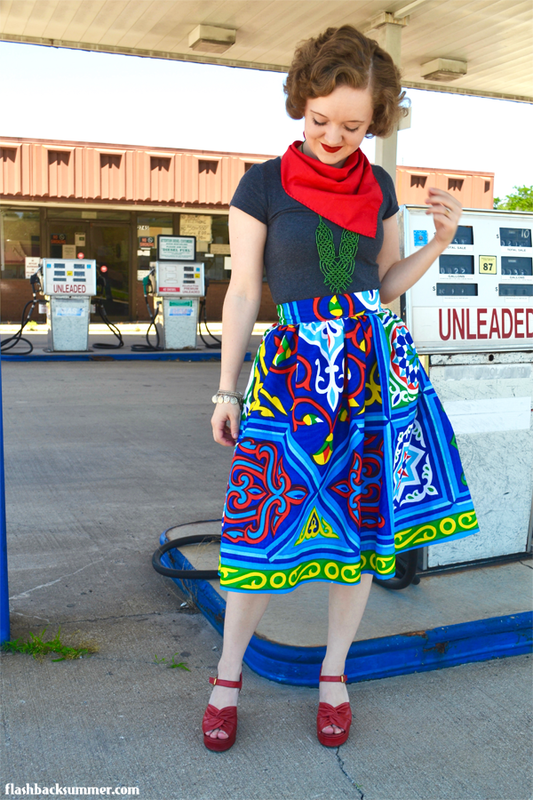 Nowadays sometimes they'll cheat and print the designs onto the fabric, like the material I used to make this skirt! I had some of this fabric cut out to make a dirndl skirt, but I hadn't put it together yet. I figured now was the time to get on it! 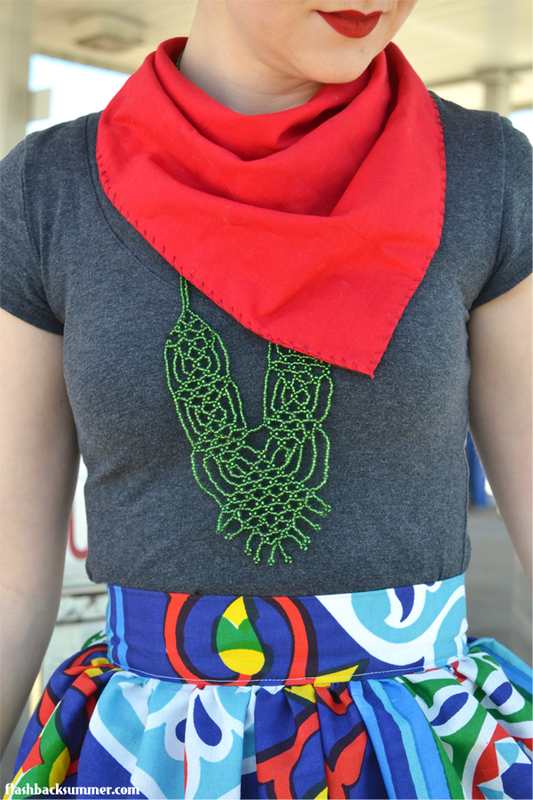 I paired it with a bandana and a necklace made by an old grandma in my parents' village. Because why wear just one thing around your neck when you can wear two? I also wore my touristy belly dancer bracelet that jingles loudly when I move! That with some sassy red heels and lipstick, and I was good to go! 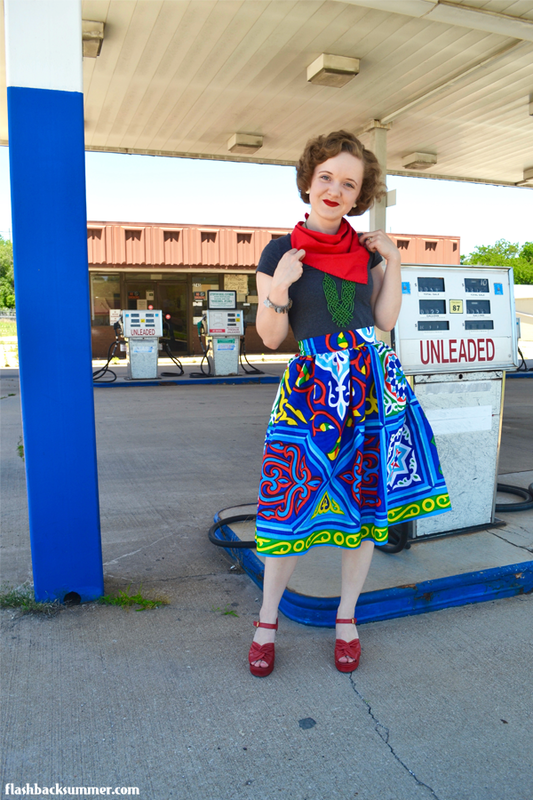 And why photos at an old gas station, you ask? Well... it was on my way to the grocery store and matched my blue skirt. We're a bit lacking in Egyptian-style locales in my Missouri town, so color matching had to do. 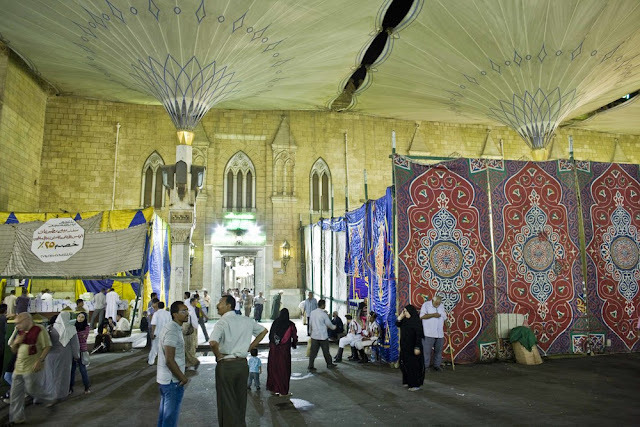 Do you know much about Ramadan? Have you ever broken the fast with a Muslim friend or have celebrated it yourself? 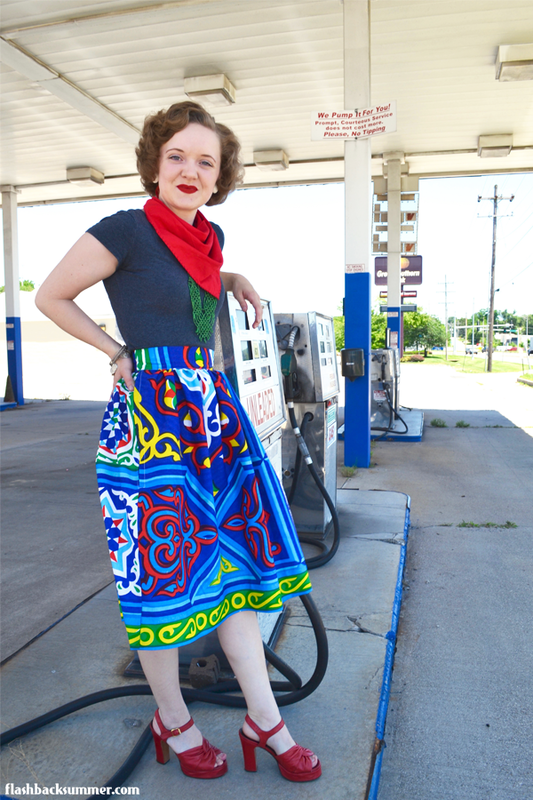 Wow that skirt looks awesome, such amazing fabric! That is really beautiful! 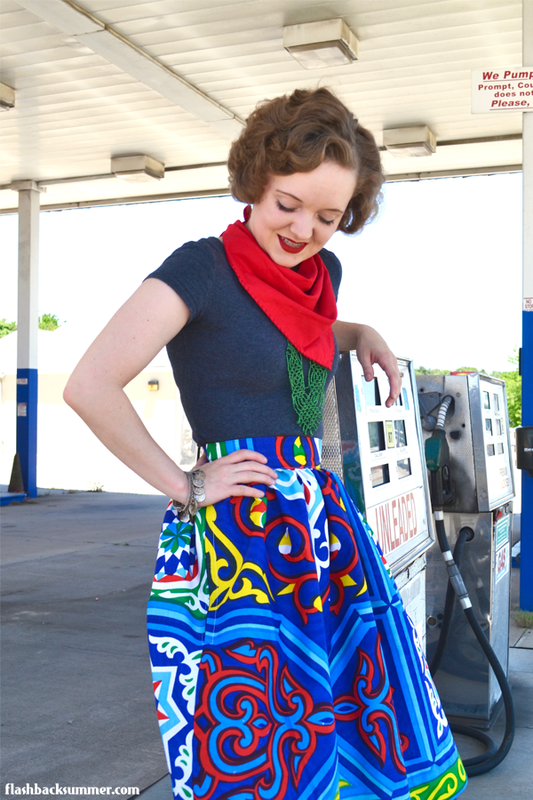 I love how bold and vibrant the pattern and colors are. Lovely skirt! The colors are so bright, and just pop! My family were friends with an Iranian Muslim family when I was growing up, though I honestly can't remember them ever celebrating Ramadan. The only holiday I remember celebrating with them was Nowruz, the Iranian New Year. 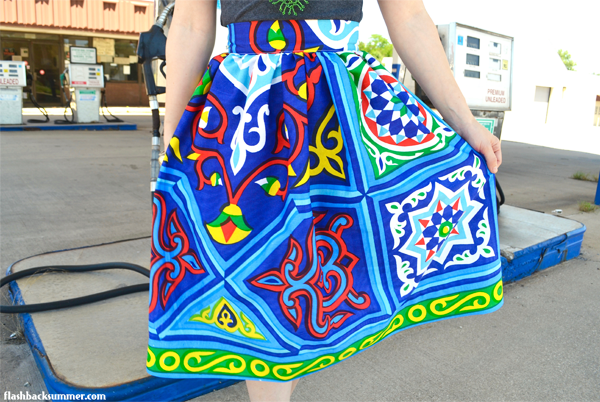 The fabric of your skirt is so beautiful and bright and I adore the richness of the main blue. It's always great to see traditional fabrics from across the globe turned into much more modern Western clothing and you do it so well. I think you would've liked this week's Great British Sewing Bee as it featured fabrics from China, India and West Africa. The sewers made some incredible pieces with them. Ooooh, I'll have to see if I can find it online! I always like inspiration! Gorgeous skirt! I love the richness and vibrancy of the colours at play in its fabulous design. What a poignant way to pay tribute to this important holiday, as well as to your time spent in Egypt. Haha, thank you Emily! I wasn't sure about it... but that makes me feel better, haha! That's wonderful to hear, Michele! I'm glad your experience with Egypt was good. I sure loved it a lot! This is so colorful! I love it! 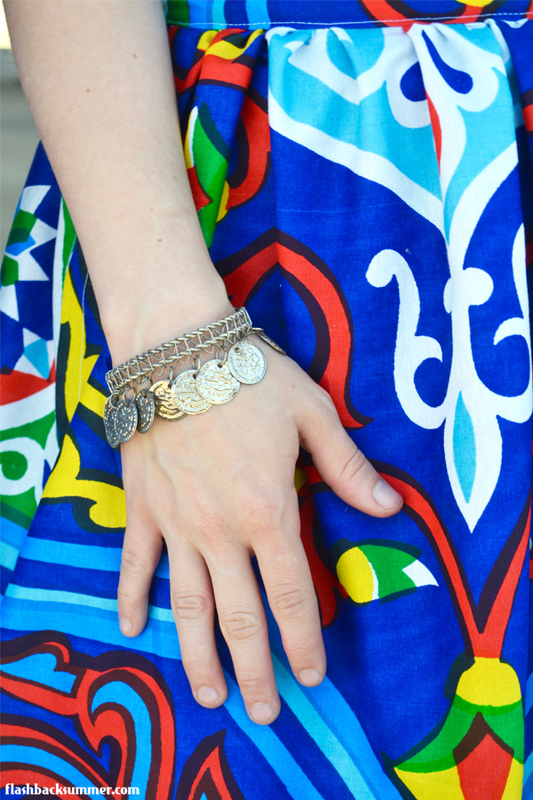 I especially love the jewelry elements that you pulled in too! That necklace is to die for!